Participants of the Global Management Accounting Summit 2015, which is slated to be inaugurated on 27 July, will be able to gain fine insights on Integrated Reporting from a global perspective with top professionals from overseas addressing the gathering. The annual conference hosted by CMA Sri Lanka will facilitate its technical sessions over two days, following the inauguration, under the theme ‘Business Resilience through Integrated Reporting’. The technical sessions which will take place from 28 to 29 July will see a number of top international experts explore in depth the timely topic of Integrated Reporting. Kicking off the first day of the technical session series will be Minister of Finance Ravi Karunanayake who will deliver his address as the chief guest. The first day will take place over four sections, with each session featuring top professionals deliberating at length their area of expertise. Sessions will conclude with a panel discussion and a Q & A session, providing the audience an opportunity to engage and interact with the speakers. The first session of the first day will be chaired by none other than International Federation of Accountants (IFAC) President Olivia Kirtley, who will also deliver the keynote address on the topic ‘Integrated Thinking, Integrated Reporting, Role of IFAC in Accountability and Governance’. Strategy & Integrated Thinking Consultant Graham Terry from South Africa will then deliver the second address on the topic ‘Integrated Thinking as a basic platform of Resilient Business Models’. The panel discussion will present the two speakers along with ICA Pakistan President Yacoob Suttar a member of the IFAC Professional Accountants in Business Committee. The second session will be facilitated by International Integrated Reporting Council (IIRC) Technical Director (Framework Development) Michael Nugent who will speak on ‘The Complete Architecture of the Integrated Reporting and its Current State of Evolution’. The session will then be followed by a panel discussion that will feature Institute of Cost Accountants of India President Dr. A.S. Durga Prasad and ICMA Pakistan President Kashif Mateen Ansari along with speaker Nugent. The third session that will see Past President SAFA and Member of IFAC, PAIB Committee A.N. Raman and International Integrated Reporting Council Regional Lead, India, Devesh Rapartiwar address at length the topics ‘Primer on the Accountants Connect with Integrated Thinking and Reporting’, and ‘Building Blocks of the Integrated Reporting,’ will include in its panel discussion ICA Bangladesh President Masih Malik Chowdhury. The final session of the first day will address the topics ‘GRI and Sustainability Reporting to Migrate to Integrated Reporting’ and ‘Integrated Reporting – Getting Started’, delivered by GRI Director South Asia Dr. Aditi Haldar, and Diesel & Motor Engineering PLC (DIMO) Chief Financial Officer Suresh Guneratne. Alongside the two speakers at the panel discussion will be ICMA-Bangladesh Prof. Swapan Kumar Bala. 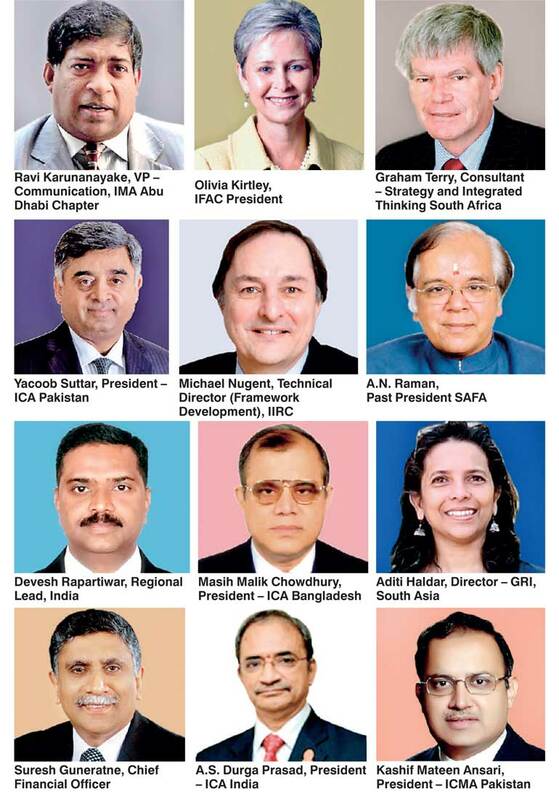 The Global Management Accounting Summit 2015 will feature a total of 21 speakers and panellists who will bring with them a wealth of experience from the UK, USA, South Africa, Singapore, Malaysia, Dubai, India, Pakistan, Bangladesh and Sri Lanka. The summit is supported by the International Federation of Accountants, International Integrated Reporting Council and Global Reporting Initiative, and is co-hosted by the Institute of Management Accountants of USA, Institute of Cost Accountants of India, Institute of Management Accountants Pakistan and Institute of Management Accountants Bangladesh. For details and registration please contact Shanthi on 071-4705536 or email registrations@cma-srilanka.org.